With over 45 years combined experience, Drivetrain Parts of Las Vegas has set the standard for fast shipping and customer service. We have a large inventory of Differential Parts, Manual Transmission Parts, Transfer Case Parts and more. Drivetrain Parts of Las Vegas offers a large selection of quality discounted parts and accessories for cars and trucks. Including Re-manufactured Transmissions and Transfer cases, Differentials, Ring & Pinion, Positraction, Bearings, Seals, Axles and many other rear end parts for Dodge, Cadillac, Chevy, Chrysler, Ford, Toyota. Honda, Suzuki, Oldsmobile, Buick, Pontiac and many other brands. Yukon Gear & Axle, Motive Gear, Ten Factory, Eaton, Powertrax, Lockright, North Coast, Auburn, Timken, Koyo, Rough Trail, AAM, Dana, Richmond Gear, USA Standard, CHA, Spartan Locker. We ship UPS Ground, 2 Day Saver or Overnight Express in the Continental USA. We have differential rear end (third member) parts including gear sets / ring and pinions from great manufactures such as Yukon, Motive, CHA, Sierra and more. Rear-end bearing rebuild overhaul kit available with Koyo or Timken bearings. Spider gears, seven different types of limited slip positraction and locking differentials, and other components. All at discounted prices available in Las Vegas and Worldwide. Differential rear end (third member) parts including gear sets / ring and pinions, rear-end bearing rebuild overhaul kit, spider gears, seven different types of limited slip positraction and locking differentials, and other components. Automatic transmission rebuild kits, torque converters, shift kits and other individual hard parts. 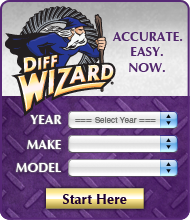 We have a differential identification chart with information on how to identify your vehicle to help you find which differential parts will fit your vehicle here. For transfer case applications there is a guide to help you find your vehicles transfer case tag as well as a detailed chart that will let you cross reference your tag number with the part number that will fit your vehicle here.